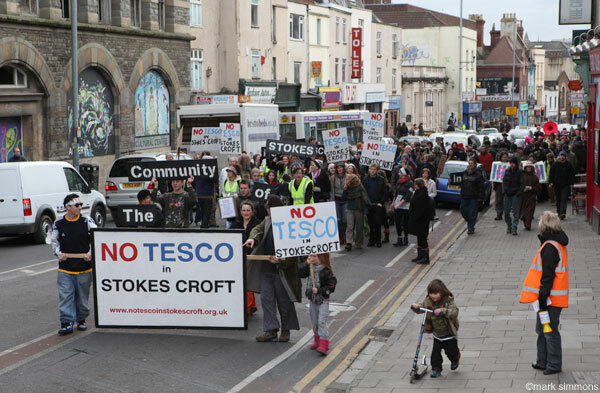 In a public letter the leader of Bristol City Council, Barbara Janke has asked Tesco to back down over its plans for Stokes Croft and allow the site to be used by a community-owned alternative . Despite invitations Tesco has refused to meet with representatives of NO Tesco in Stokes Croft, making a mockery of their claim to “listen to people in the community” . Local groups representing over 3000 people have today written to Tesco asking them to respond to the Council’s plea by the end of the month. Stop taking over our towns and cities. Like communities across the country, we don’t want a Tesco on our high street. Stokes Croft is Bristol’s cultural quarter with many independent, local traders. It’s distinctive, vibrant character is why people come to the area. A Tesco opening on Cheltenham Road will undermine the progress we have made. Your shop will not contribute to the local economy to the same extent local businesses do. Over 2500 people in the local area have written to Bristol City Council saying we don’t want Tesco and the community must be consulted properly. Local traders believe the Tesco isn’t needed. Together, we have attempted to stop Tesco through the planning process but have found this heavily weighted in your favour. You will no doubt know of the concerns we have about Tesco’s intention to open a store at the above site. We would like Stokes Croft to become a distinctive destination in Bristol and do not believe another chain store will help achieve this aim. Tesco, we know, is proud of its pledge to “listen to people in the community from the moment we identify a site for a new store”. Tesco says it wants to “respond to suggestions and concerns people might have”. We would like to take you at your word and seek assurances from you that you will consider backing down over your plans and allowing the site to be used by a community-owned alternative. Some local groups feel very strongly that Tesco has failed to engage with them. They want to see the site used for something other than a supermarket. Will you meet them to discuss their ideas? Tesco say: “We listen to people in the community from the moment we identify a site for a new store or an extension. We want to respond to suggestions and concerns people might have.” They bought the premises in December 2009 and the first contact they had with the local community was on 12 February 2010: a phone call from Michael Kissman to one of the campaign coordinators in response to a letter from the campaign requesting a meeting. After initially saying Tesco would meet with the campaign Michael has since made it clear Tesco will not meet with the local community groups in the area. A survey of 500 local people shows that 96% of those surveyed believe Cheltenham Road does not need another supermarket. Tesco have said on the radio people in Stokes Croft want a Tesco. They have refused to substantiate this claim. Tesco have a track record of saying the community wants one of their stores even when the majority in the community clearly do not. The following statement has been issued by Cllr Barbara Janke, Leader of Bristol City Council, and Stephen Williams, MP for Bristol West 2005 – 2010 and Lib Dem candidate for the general Election. Write to the Evening Post and other local media to express your concerns. Lots of letters have been published in the paper and the Evening Post want to hear from more of us. Michael Kissman, corporate affairs manager for Tesco is interviewed. He says that he has been in Stokes Croft over the last few weeks talking to local residents and businesses and that the reception has been remarkably positive overall. This is clearly untrue and an absolute outrage that Tesco have been able to say this uncontested – it makes a mockery of the overwhelming strength of our campaign. Email or text in to the show to let them know what you think – let them know about the strength of opposition in the community. Claire Milne from the NO Tesco in Stokes Croft campaign also debates the issues with Richard Dodd from the British Retail Consortium. Tesco challenge: can you shop in all 17 stores in one hour?